O-iii mapped to blue and green, H-a to red. TMB92SS @ F4.4, ST2000XM, Baader filters. Why, yes, you may click for a bigger view. Fleming quickly proved Pickering right by developing a new system to classify stars according to their spectra... Thanks to her new classification system, which became known as the "Pickering-Fleming System," Fleming cataloged over 10,000 stars within the next nine years. In 1890, she published her findings in the Draper Catalogue of Stellar Spectra. During the course of her [32 year] career, Fleming discovered 10 novae, 52 nebulae, and 310 variable stars...  Recognizing her contributions to the discipline, in 1906 the Royal Astronomical Society elected Fleming to its organization, the first time that prestigious body admitted an American woman. In 1910, she reached the pinnacle of her career by discovering white dwarfs, which are very hot and dense stars that are white in color. On May 21, 1911, Fleming died of pneumonia in Boston, Massachusetts. Williamina Fleming standing at center, c. 1891. Note variable star plot to viewer's left (Beta Auigae, an eclipsing binary, from Dec 1889). The other plot may depict the light curve of an eclipsing binary during a single minimum. 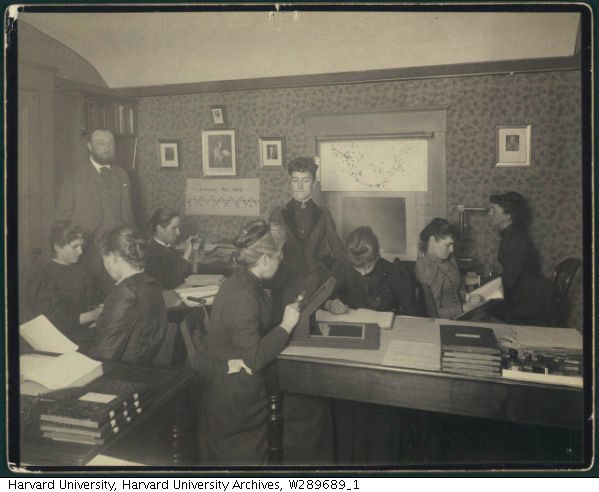 Harvard College Observatory Director Edward C. Pickering is in back. Henrietta Swan Leavitt (rear left, with magnifying glass). In her naturalization petition, Williamina says she arrived in America on December 3, 1878, in New York. In the 1900 census, she says "1884." Wait! See below, she who came in 1884 is the astronomer's niece. Things can get confusing. Her son was born on October 6, 1879, and she named him Edward Pickering Fleming, after her employer. He was born in Dundee, Scotland, and he was naturalized as a U.S. citizen on the same date as his mother, January 12, 1904. Williamina sent Edward to MIT. He made a career as a chemist and metallurgist in Salt Lake City. More to the point: she hired dozens of young women to conduct the work of the observatory, prepare reports, make revisions, do calculations... etc. Fleming lamented that very little time, opportunity, or resources were available for her to pursue her own original work. Such ennumerations caught the attention of the contemporary press, but they happened in the course of other research. Her real contributions were epic, Sisyphusian, Herculean: the Draper Catalog and the spectral classification techniques that enabled it, the observatory's year-in year-out surveys, endless plate-cataloging, and staffing. Williamina had a key role (perhaps the key role) in managing "the trenches" of daily work at the Harvard headquarters as well significant rolls in keeping remote stations in western Massachusetts and Peru organized and efficient. In 1890, while examining a plate made in 1888, Fleming discovered the Horsehead Nebula in Orion. I do hereby and henceforth resolve to call it "Fleming's Pony." In 1904, Fleming noticed the tangle of filaments in the center of the Veil Nebula in Cygnus. The director's name was attached to the discovery, perhaps by custom, probably with Fleming's approval (she'd named her son after the director after all). Hence the common name for this nebula: "Pickering's Triangle." After Williamina Fleming took charge of staffing the observatory with computers, she hired women exclusively (or almost exclusively). The computing department came to be called "Pickering's Harem." Women were meticulous and reliable, she believed, anxious to find meaningful work, and generally grateful and loyal when they got it. It is also true that they worked for less money. By 1900, Fleming's salary had approximately tripled from $10.50/week to $1,500 per year (she says that men in similar jobs were paid $2,500). She was hired to work 7 hours a day for 6 days a week but generally worked from around 9 AM to around 6 PM, or about 9 hours per day. All was not work: evenings and Sundays she often attended plays at the Castle Square Theater with Annie Jump Cannon and a few of the other "computers." By 1900, Fleming had hired an Irish servant, Marie Hegarty, to help keep up with her home (267 Upland Avenue, in a warren of residential streets a short walk north from the observatory). Before 1910, Mary McMurray, a Scot, had taken Marie's place, and Williamina's mother Mary Stevens (77), who immigrated in 1887, had joined the household at 57 Concord Avenue, on or adjacent the Observatory grounds. And apparently just to frustrate inquiring biographers, Williamina Fleming's niece Williamina Fleming (18 years younger than Williamina Fleming), a stenographer who had come to America in 1884, lived there, too. The older Williamina, our Williamina, is shown in the 1910 census as widowed, the younger single. Let's talk about something simpler, like deep-sky narrow-band bi-color astrophotograhy. So I find all this fascinating material, Fleming's journal, the backstory, etc., and within a few weeks Dava Sobel comes out with The Glass Universe all about Fleming and the other Harvard Observatory computers. It's a REALLY good book. She even uses the same photo of Pickering's computers on the cover. My photo of Fleming's Triangular Wisp, is a bi-color composite. I took 1h45m of data in the light of doubly ionized oxygen (O-iii) and another 1h45m in the light of excited hydrogen (hydrogen-alpha). Then I wasted hours working with a classic green-synthesis version: take the mean of the blue and red signal and use that as green; combine all three channels to make a color image. No matter what I did, the nebula was unclear, fuzzed out, no damn good. I decided to call it a night and went to take a shower. And there realized that in this case the mean of the two signals was manufacturing nonsense. Here, the H-a and O-iii images look very different because they capture entirely different tendrils of hydrogen and oxygen. It's not the same strands glowing at different intensities, but distinct strands of different material. The mean, the synthetic green, was nonsense that weakened the real signal in both channels. So I dried off, put on my robe, and tried it again without a separate green channel. Instead, I used the O-iii signal for both blue and green while increasing the weight of red (hydrogen-alpha) to compensate for the "extra vote" I'd given to O-iii. Voila! The result is as you see. My deep-sky photos are made with a variety of sensors and optics. Deepest images usually come from a SBIG ST2000XM CCD behind a 10-inch Astro-Tech Ritchey-Chretien carried on an Astro-Physics Mach1GTO. The CCD is equipped with a CFW-10 loaded with Baader wide- and narrow-band filters. Camera control and guiding are handled by Maxim DL 5.12. A Canon 6D and a modded 50D find themselves mounted behind an Orion 10" F4 Newtonian or a 92mm Thomas Back refractor or a tiny but mighty AT65EDQ refractor, sometimes with Backyard EOS in control and PHD Guide keeping things on target. Really widefield photos are often made using the 6D and various camera lenses and an iOptron Skytracker mount. PixInsight does most of the heavy lifting in post-processing — alignment, stacking, gradient removal, noise-reduction, transfer function modification, color calibration, and deconvolution. Photoshop along with Focus Magic and a handful of other plugins get their licks in, too, especially when polishing for the web.